Step back in time into the mobster world of the 1930s with likes of notorious gangsters like Bugsy, George Baby Face Nelson and feel like you are Al Capone himself with this vintage gangster themed onlineslots game. The game sets the scene with the jazz music which was so popular in the 1930s, especially among those who would frequent smoke-filled basement jazz clubs and luxurious underground establishments and will transport you to the faintly lit streets of the gangster world. In the game you’ll encounter a vintage getaway car, a glamorous 1930s styled woman with pin curls and cigarette and a gangster with a gun who has donned a stylish trilby which are all in keeping with the theme and add to the enjoyment of the game. Don't forget to take a look at our range of slot bonuses UK! Let’s get down to business, this slot game has 5 reels, 3 rows and is played across 20 fixed paylines, so isn’t an uncommonly layed out slot game, making it user-friendly. The game is also full of thrilling features to keep you on your toes, including three fixed jackpots which are displayed to players at the top of the slot game as Mini, Major and Grand. 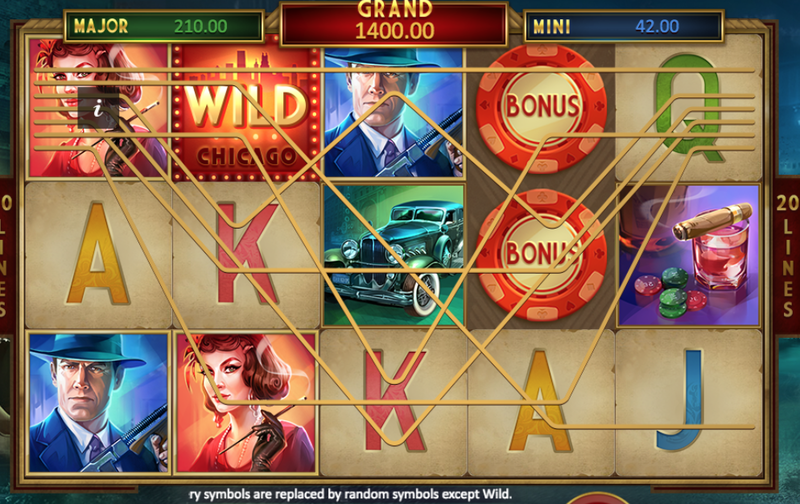 Like most slots, the game included the lower paying symbols which are the usual suspects, the card symbols, but the high paying symbols are the ones to watch out for, which include: a policeman, a vintage getaway car, a whiskey tumbler accompanied by a cigar as well as the Wild symbol which can be substituted for any other symbol on the reels, apart from bonus symbols which are red, blue or green casino chips. The game has a mysterious nature and there is a Mystery Feature to be discovered on the reels and could help you win anything from 70 to 200 times your initial bet. Keep your eyes peeled for the Jackpot Bonus Game too which is triggered if you are lucky enough to land 6 or more bonus symbols during a single spin, with each bonus symbol providing winnings from 1 to 48 x your total bet. 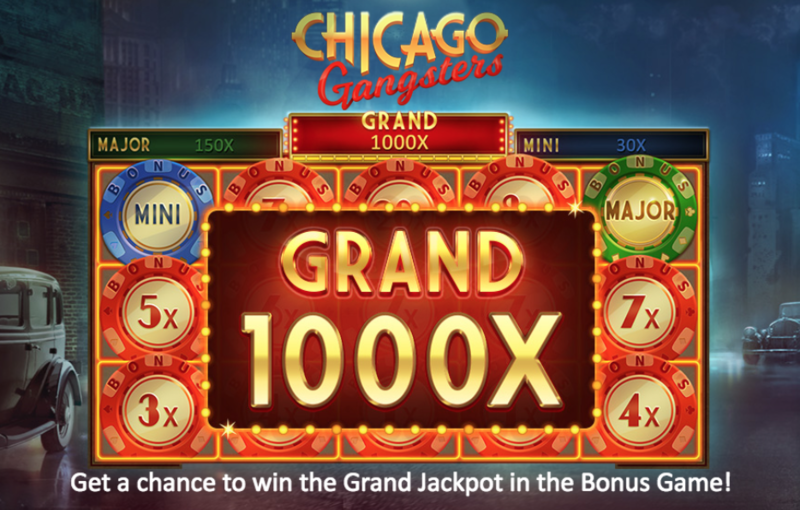 Chicago Gangsters is a brilliantly designed game with impressive visuals and cutting-edge graphics that make the gameplay enticing and entertaining which is helped along by the scene setting smooth jazz soundtrack. 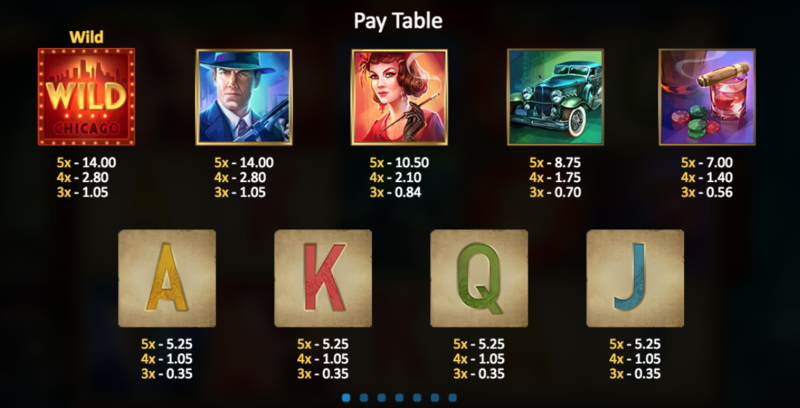 Sit back, relax and be lured into the 1930s world of gangsters as you watch the colourful reels spin around and rack up some fantastic bonuses. The bonus game and the mystery feature keep the game interesting so it certainly isn’t a repetitive slot game, that you find with some slot games UK.